Since nearly his first day in office, President Trump’s administration has said it will dramatically boost the number of agents at the nation’s borders. There was a holdup, however: the Homeland Security Department has been failing for years to bring on more Border Patrol agents than it lost, a trend that has continued into Trump’s presidency. The tides are finally turning, according to DHS Secretary Kirstjen Nielsen. 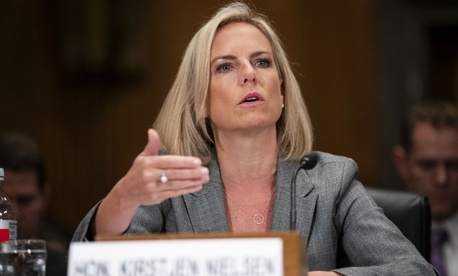 “The good news is for the first time in many, many, many years we are hiring [agents] at a rate that is outpacing the rate at which we are losing [them,]” Nielsen told the Senate Homeland Security and Governmental Affairs Committee this week. Shortly after taking office, Trump signed an executive order mandating Customs and Border Protection hire 5,000 additional border agents. CBP quickly began developing a strategy to implement the hiring surge, despite Congress repeatedly declining to fund it. The agency has made improvements in its dozen-step hiring process, leading to faster results. CBP has revised its polygraph tests, though still just 26 percent of potential Border Patrol agents passed the tests last year, according to a recent Government Accountability Office report. It has also made adjustments to its physical testing and has received direct hire authority from the Office of Personnel Management for law enforcement jobs. In addition, CBP has signed a contract with Accenture worth up to $297 million to help with the recruiting and hiring process, which GAO said “seems promising” but is still too early to definitively assess. Accenture as of August collected $43 million and onboarded around 600 new employees. For two consecutive years, CBP has advised lawmakers in their final appropriations bill to reduce its allocation for personnel by more than $200 million because its payroll costs were set to fall short of its projections. The agency saw a net decrease in employees in 2017, a trend that has continued in 2018 until now. Border Patrol hired 4 percent more agents last year, but failed to keep pace with the losses sustained at the agency. DHS could soon receive a boost in its recruiting efforts, as the Senate this week unanimously passed a measure to make it easier for the department to offer bonuses to CBP employees. The 2017 Customs and Border Protection Hiring and Retention (CBP HiRe) Act (S. 1305) would give CBP the authority to offer recruitment, relocation and retention incentives for law enforcement positions in remote areas that the agency is struggling to fill. CBP could also noncompetitively appoint employees to such positions in which there is a “severe shortage of highly qualified candidates.” The measure would allow the agency to create special rates of pay and offer commuting expenses for law enforcement personnel in “undesirable and hard-to-fill locations.” CBP would be prohibited from sharing the results of polygraph exams with any other federal agency, which lawmakers said would address fears of the application process causing long-term damage to applicants’ careers. The bill, written by Sen. Jeff Flake, R-Ariz., and cosponsored by Sen. Heidi Heitkamp, D-N.D., has the backing of several federal employee groups, including the National Border Patrol Council, the National Treasury Employees Union and the Federal Law Enforcement Officers Association. The measure now heads to the House for a vote. The Congressional Budget Office has estimated the bill would add “insignificant” costs because it already assumed CBP would spend tens of millions of dollars on bonuses by getting special permission from OPM.